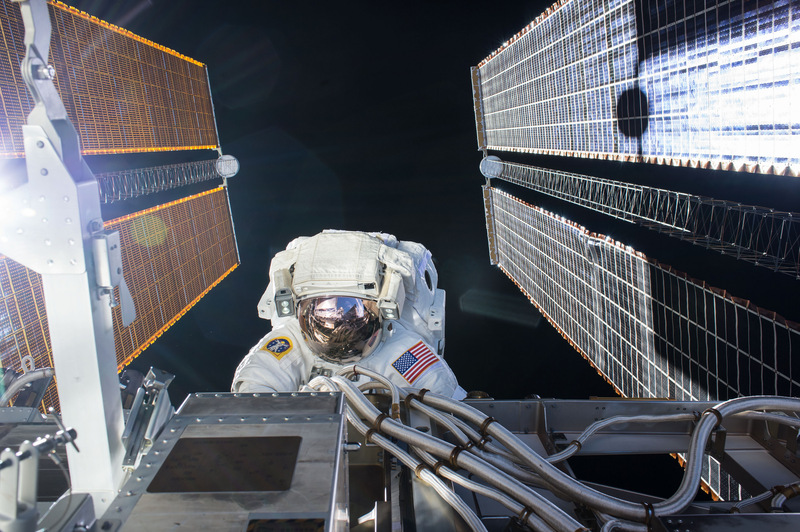 Two experienced spacewalkers will venture outside the hatches of the International Space Station on Friday to complete the installation of new batteries on one of the Station’s eight power channels that started with a flurry of robotics last weekend. 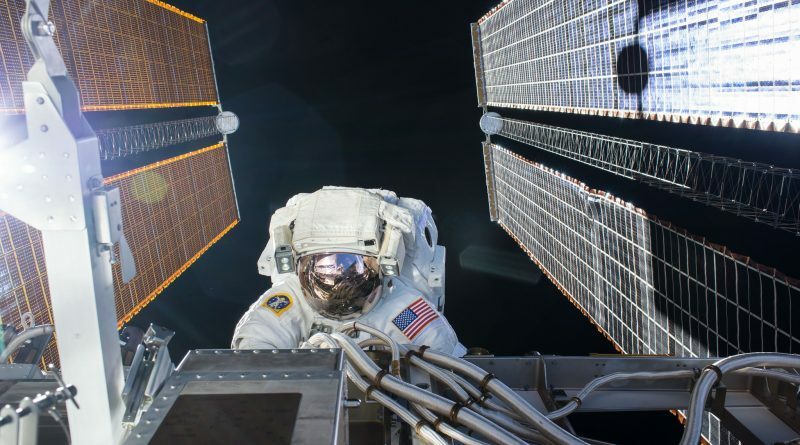 NASA Astronauts Shane Kimbrough and Peggy Whitson are expected to work for six and a half hours to install a group of three Adapter Plates, hook up three new batteries and move two old ones to enable the revamped power channel to be taken back on-line. 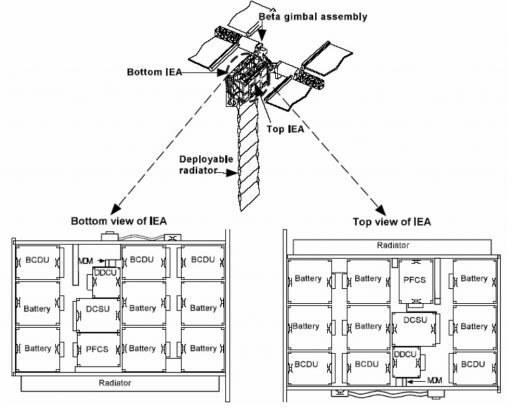 Dependable batteries are an absolute necessity for the operation of the International Space Station, constantly drifting in and out of orbital night. For an average of 35 minutes per lap around the planet, ISS is in darkness and its batteries must take over for the solar arrays. 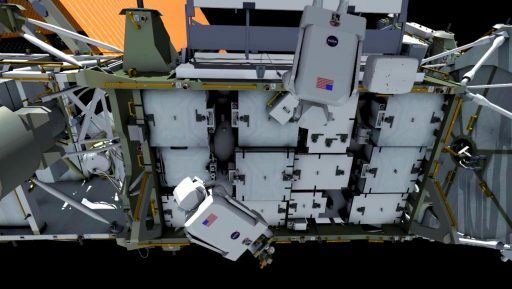 To ensure the Space Station can run efficiently through the end of its operation in the late 2020s, all 48 batteries installed on the Station’s truss will be replaced in a sequential effort unfolding over the next four years. All of the Station’s Nickel-Hydrogen batteries have outlived their 6.5-year service life, most having been installed on their respective truss segments ever since being launched in the 2000s. The replacement effort also provides an opportunity to switch from the antiquated Ni-H batteries to state of the art Li-Ion batteries that offer a greater storage capacity at a lower weight. 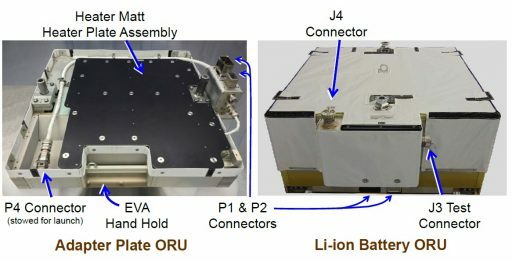 The first batch of six new Li-Ion Battery Orbital Replacement Units flew up to ISS on the Japanese HTV-6 cargo spacecraft in December and will replace a dozen of Ni-H batteries powering two of the Station’s eight power channels with one Li-Ion battery replacing the capacity of two Ni-H batteries. 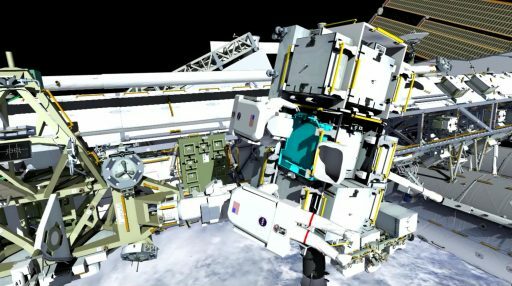 The work to replace the batteries is being shared by the crew members and the Station’s robotic duo – the 17-meter Canadarm2 and two-armed Dextre robot. The robots are in charge of moving the heavy battery units and spacewalking crews lend a hand with tasks the robots can not complete such as installing adapters and power cables. Classed as the most complex robotic maintenance operation in ISS history, activities picked up New Year’s Eve after Power Channel 3A was deactivated and loads transferred to 3B. In a carefully choreographed effort, Dextre and Canadarm 2 moved batteries between their operational location known as the Integrated Equipment Assembly (IEA) on the S4 truss and the Exposed Pallet of the HTV spacecraft that provides the mounting fixture to take new batteries up to ISS and dispose of old units via a fiery re-entry. 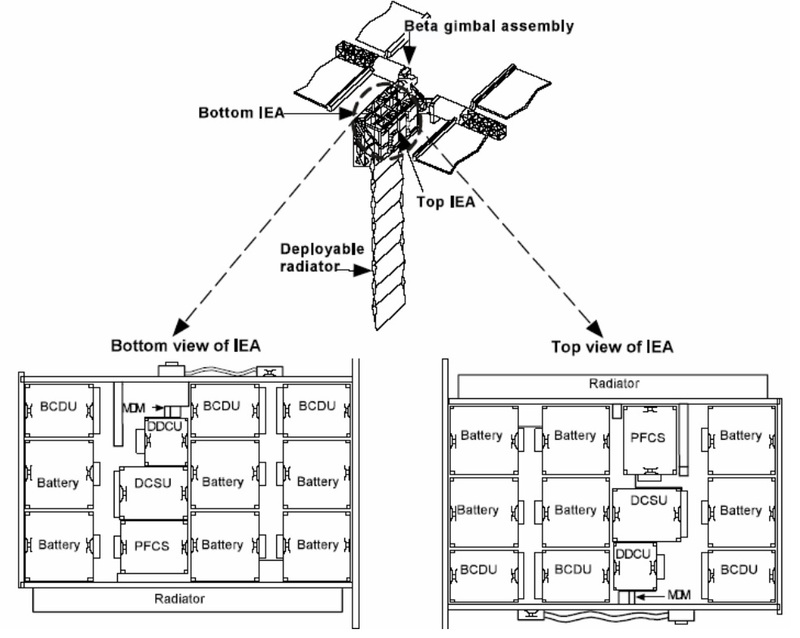 After four days of work, Dextre and Canadarm2 managed to remove four spent Ni-H batteries from the IEA and install three new Li-Ion batteries. The new batteries reside within IEA slots 1, 3, and 5; Slot 6 is currently empty and Slots 2 and 4 still facilitate old Ni-H batteries to be moved during the EVA. 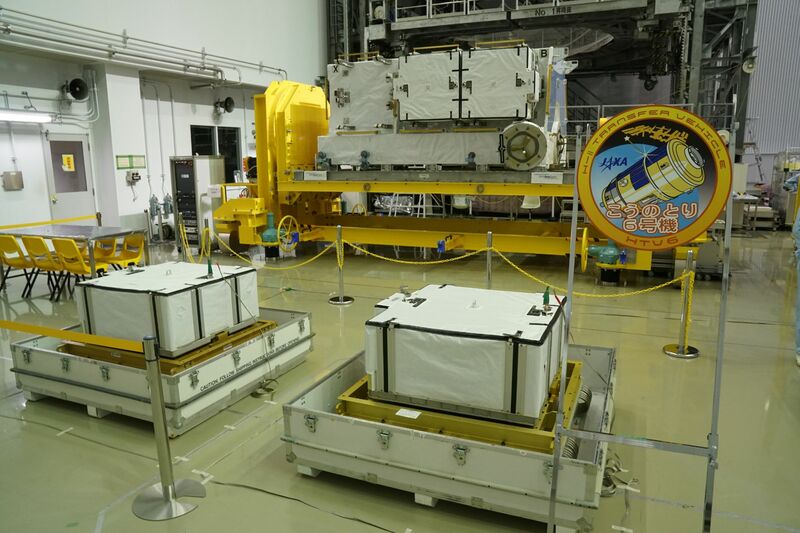 Of the four spent discarded Ni-H batteries that were removed from the IEA three are already on the HTV Pallet for disposal and one is in a temporary location on Dextre. 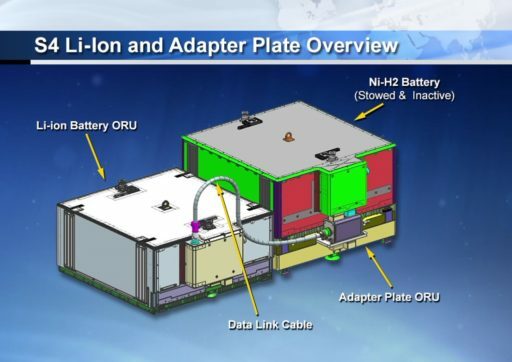 The goal of Friday’s EVA is to install three Adapter Plates in the slots not occupied by the new Li-Ion ORUs and in the process move the two remaining Ni-H batteries atop the adapters to be available as spares. 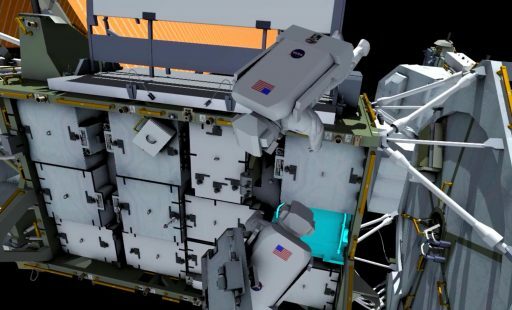 To integrate the new batteries, the spacewalkers will put in place three data cables and other tasks are to prepare the next set of batteries for removal and deal with a stubborn bolt on one of the new Li-Ion batteries. The adapter plates, each 104 by 91 by 38 centimeters in size, are needed because one Li-Ion battery replaces a string of two Ni-H batteries that were connected in series to interface with a Battery Charge/Discharge Unit (BCDU). The adapters essentially mimic another battery to bridge power & data connectivity from the BCDU over to the lone battery. Each adapter plate has two blind-mate electrical connectors that automatically engage when being installed and one data link cable that has to be plugged into the Li-Ion battery by the crew. Venturing outside the Station at 12:05 UTC on Friday, Shane Kimbrough, serving as EV-1 & wearing the suit with red stripes, will be embarking on his third career EVA while Peggy Whitson, EV-2 & all-white suit, will be conducting her seventh excursion. The EVA will begin with Kimbrough exiting the Quest airlock first & receiving a Crew Lock Bag from Whitson before she will climb out as well for the prescribed suit and safety tether checks that are at the beginning of every U.S. spacewalk. 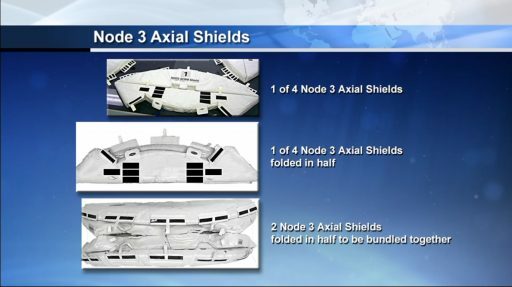 Kimbrough’s first task will take him to the Starboard CETA Cart where he will pick up a foot restraint before translating out to the S4 truss segment, on the way anchoring a tether reel to get an extra length of tether. 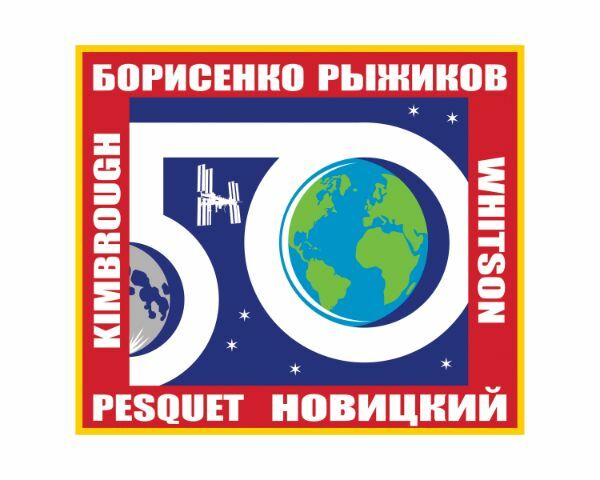 While Kimbrough sets up shop at the S4 IEA, Whitson will be working her first task on the HTV Pallet, using a ratchet wrench to break torque on the Adapter Plates – totaling six bolts of the standard FRAMs (Flight Releasable Attachment Mechanism). Joined by Kimbrough, Whitson will release the first two Adapter Plates that will then be carried over to the IEA on the Astronaut’s body restraint tethers. At the IEA, the crew’s first task will be installing the first Adapter Plate in the empty Slot 6. Kimbrough will ingress the foot restraint he installed earlier and receive the Adapter Plate from Whitson, using guide rails to properly position the 39-Kilogram plate and then use the Pistol Grip Tool to drive the H1 and H2 bolts to firmly install the Adapter Plate. 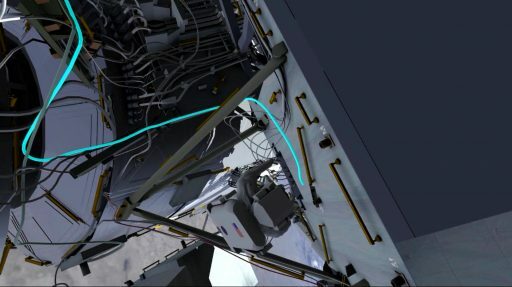 Next, the crew will put in place a data link cable that connects the adapter plate to the Li-Ion battery in Slot 5 and closes the circuit to the Battery Charge/Discharge Unit, allowing Mission Control to begin checking out the first new battery system. Next for the spacewalkers will be the removal of Ni-H Battery 4, requiring them to release only the primary H2 bolt since Dextre already took care of all secondary bolts back in April. 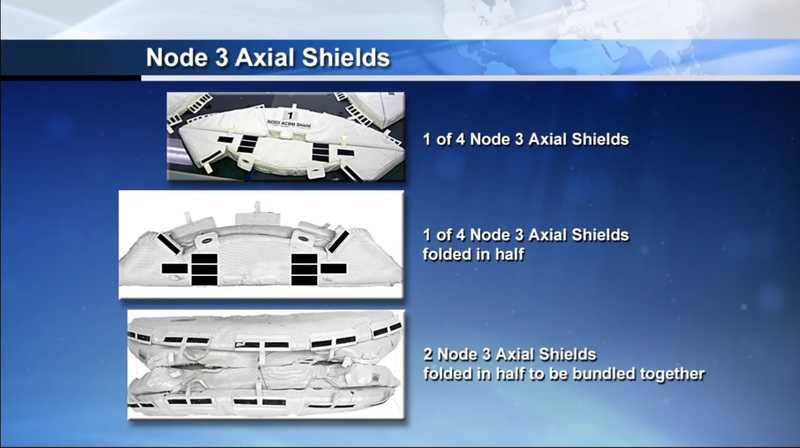 Kimbrough will remove the 169-Kilogram Ni-H ORU and hand it off to Whitson who will hold onto it while Kimbrough re-positions to be able to install the battery on Adapter Plate A via the two FRAM bolts. Slot 4 will receive its Adapter Plate next, again with two bolts to be driven by Kimbrough followed by the installation of the Data Link Cable between the battery and adapter to give Power Channel 3A two good batteries. Mission Control considers the power channel operable with two good Li-Ion batteries, marking the minimal objective of the EVA. The last Ni-H battery, residing in Slot 2, will be released by Kimbrough and re-installed over Adapter Plate B – freeing up the last slot to receive an Adapter Plate. Both crew members will move back to the Exposed Pallet to fetch Adapter Plate C and move it to the S4 IEA for installation. The last data link cable will be put in place to fully restore the 3A channel which will be thoroughly checked to ensure the batteries are charging safely and showing good temperatures before loads are once again placed onto the channel. 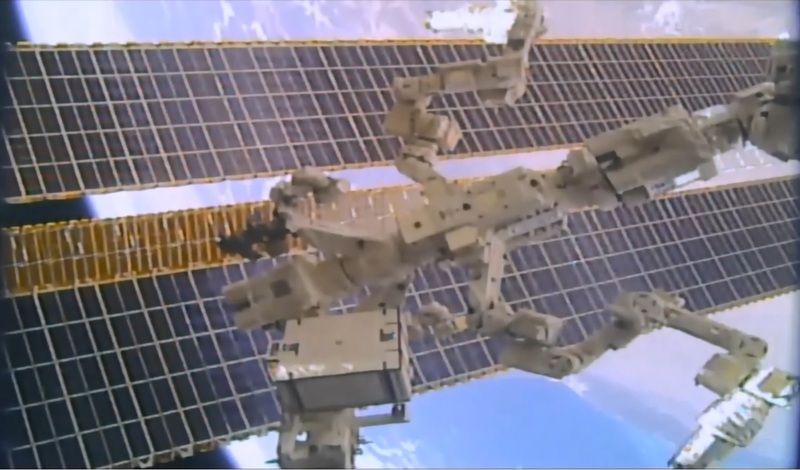 If time permits at the end of the EVA, the spacewalkers will be tasked with some manual bolt actuation on two bolts that proved out troublesome for the Dextre Robot. Shane Kimbrough will move to the 1A side of the IEA to release a single bolt Dextre could not release during the preparatory work completed in April and the manual release will ensure the robot won’t run into trouble when dealing with the 1A batteries next week. Another stubborn bolt is the H1 secondary bolt on the Li-Ion battery in 3A Slot 1. This bolt was to be fastened by Dextre on January 4 to finish that battery’s installation but ROBO controllers were unable to drive the bolt with Dextre’s ROST tool. Meetings were held to discuss the bolt issue and the crew may be asked to manually revisit that bolt should time permit during the EVA to fully install the battery. Only the primary bolt is required to hold the ORUs in place, but it is generally preferred to have both bolts secured in place. Should the crew be ultra-efficient on Friday, they can look at a number of get-ahead tasks from a list of open operations left over from previous EVAs. The first get-ahead is on the central truss segment of the Station to route a bundle of data cables from the rat’s nest on the Z1 truss – named for the chaos of cables in that particular location – over to the S0 truss. One crew member will route the cables from Z1 to S0 while the other will be inside the S0 truss segment to receive two of the three cables to be pre-positioned for a future EVA that will install a series of upgraded computer boxes on the exterior of ISS (EPIC MDMs). A second get-ahead, only requiring one crew member, is the retrieval of the S3 CETA light located in close proximity to the S4 work site of Friday’s EVA. A fourth get-ahead available to the crew is a photo-survey of the outboard side of the Alpha-Magnetic Spectrometer 2 to gather close-up imagery of the AMS to enable ground teams to develop an EVA to outfit the AMS with new thermal protection to extend its lifetime. The final available get-ahead is the replacement of a failed Camera/Light Pan/Tilt Assembly on the Mobile Transporter Relay Assembly which would then be robotically installed on Canadarm2. 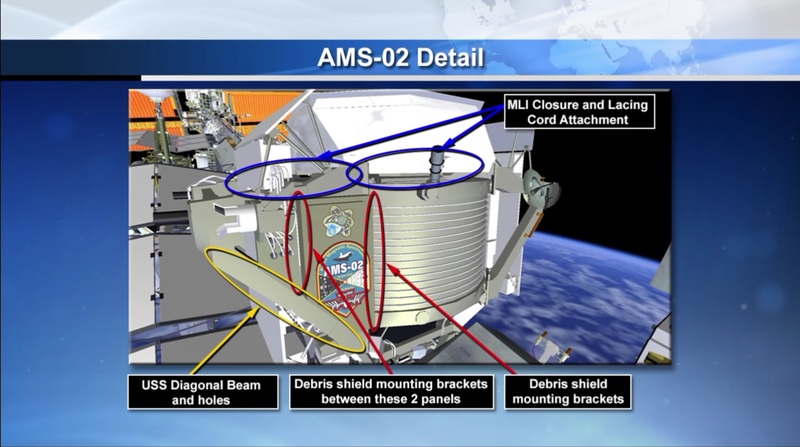 While the list of get-ahead tasks is long, the goal of Friday’s EVA is primarily focused on the batteries but having two experienced spacewalkers outside could provide an opportunity for some extra tasks to be completed. Once Power Channel 3A is up and running again, operations will shift to the 1A side with five days of robotics Sunday through Thursday to remove five of the spent Ni-H batteries and install three new Li-Ion ORUs to set up for a January 13 spacewalk by Shane Kimbrough and ESA Astronaut Thomas Pesquet to install the Adapter Plates for this channel. HTV-6 will depart ISS at the end of the month, taking with it nine discarded Ni-H batteries set for a one-week free flight ahead of a destructive re-entry. 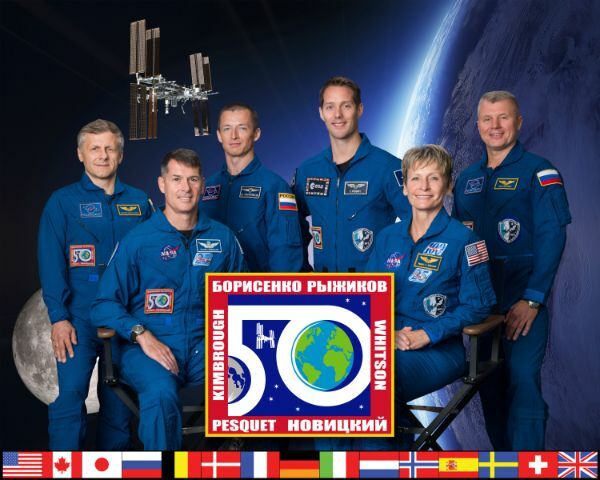 Copyright © 2019 ISS Expedition 50 | Spaceflight101. All rights reserved.